Graphene is a luminary candidate in material science as well as in biomedical applications owing to its unique characteristics. The chemical, optical, electrical, and mechanical properties of graphene make them one of the most preferred 2D materials in translational research. 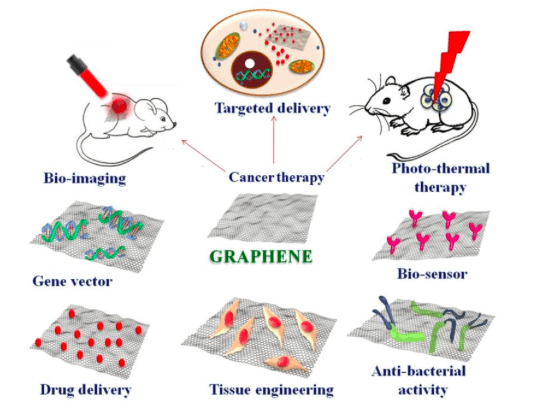 Graphene and its 2D analogs are suitable for a wide range of applications such as drug and gene delivery, anti-bacterial agents, biosensors, in bioimaging, tissue engineering, and photo-thermal therapy (1). Research outcomes substantiate the competence of graphene as a multi-functional material (Fig 1). Fig 1: Biomedical application scope of graphene. Image courtesy Mohanan, P.V. Recently in the biomedical scenario, there has been a hike in interest to explore the capability of graphene as a tissue engineering substrate. In the context of tissue engineering, graphene, graphene oxide (GO), and reduced graphene oxide (rGO) turned out to be an ideal platform for attachment and growth of stem cells. Much attention has been devoted to research focused on scrutinizing the potential of graphene for bone and neuron regeneration. Stem cell attachment on GO and graphene surface is facilitated and controlled by surface chemistry. GO promotes stem cell adhesion, growth, and differentiation by electrostatic interaction of cell adhesion proteins on to the surface while graphene interacts via hydrophobic interactions (2). Graphene promotes osteogenic differentiation and matrix mineralization which are essential characteristics for a bone regeneration material (3). Literature updates suggest that graphene is a reliable material for scaffold applications. While considering the biomedical scope, it is mandatory to evaluate the biocompatibility and its possible interactions with cells. The high surface area of 2D materials increases the chance for cellular interactions and probability for toxic responses. Graphene in its bare form is reported to elicit toxic responses in cells, notably by elevating reactive oxidation species (ROS) production, oxidative stress, DNA damage, and apoptosis. Sharp edges of graphene facilitate penetration through cell membrane leading to cell membrane disintegration. Pristine graphene was reported to provoke an increase in ROS production along with a decrease in mitochondrial membrane potential (MMP) eventually leading to apoptosis in macrophages (4). Graphene oxide in its bare form was reported to cause hemolysis and thrombosis (5). The cytotoxic reports about graphene, GO, and rGO increase anxiety about their use in biomedical applications. One of the ways to tackle the issue of toxicity associated with graphene and its analogs is through functionalization. Different surface functionalization on graphene has been developed in order to fine-tune its various physicochemical properties. Appropriate functionalization can impart interesting functionality, reduce toxicity and improve its biocompatibility thereby augmenting the application scope of graphene. Major functionalizing agents used are polyethylene glycol (PEG), pluronics, dextran, poly ethyleneimine (PEI), polyvinyl alcohol (PVA), chitosan, etc. 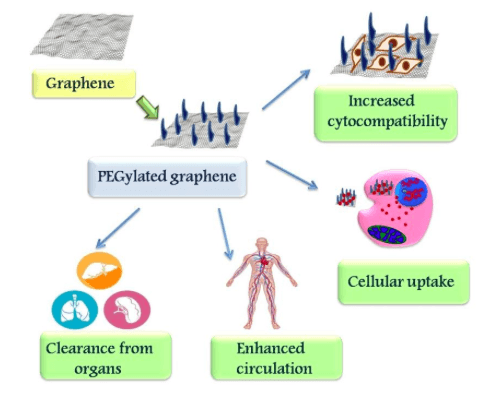 PEGylation of graphene increases the circulation time of graphene in vivo (Fig 2) and also promotes clearance of graphene from the body by reducing the retention time in various organs like spleen, liver and lungs (6). Hence, PEG is widely opted for graphene functionalization owing to its various merits. In this scenario, an interesting study on the toxicity of PEGylated reduced graphene oxide (PrGO) on mesenchymal stem cells (MSCs) was carried out. PEGylation helps in improving cellular uptake and colloidal stability, thereby surmounting the drawbacks of aggregation associated with graphene nanoparticles. Low molecular weight PEG further improves the cellular uptake, cytocompatibility, and colloidal stability compared to high molecular weight PEG (7). Therefore, low molecular weight PEG was opted for functionalization of GO. Fig 2: Effect of PEG functionalization on graphene. Image courtesy Mohanan, P.V. Hummer’s method is the commonly used method for GO synthesis from graphite (8). The synthesized GO can be functionalized effectively using O,O-Bis(2-aminoethyl) PEG by an amide bond formation between GO and amine group of PEG catalyzed by carbodiimide. Reduction of functionalized GO using sodium borohydride successfully yields PEGylated reduced graphene oxide (PrGO) (9). The synthesized PrGO showed a wrinkled structure with folding in TEM images. The thickness of PrGO was found to be apparently 8-9 nm as per AFM images. Successful PEG functionalization on rGO was justifiably evident from the IR, XRD, TGA, and XPS analysis. Exposure of mesenchymal stem cells (MSCs) to PrGO showed effective cellular uptake and localization in the cytoplasm. No trace of PrGO localization was observed in the nucleus. 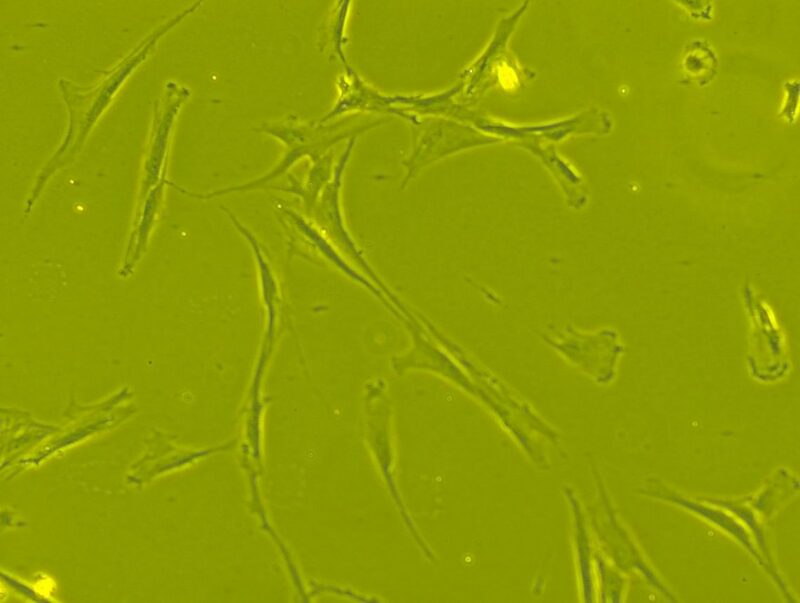 The integrity of MSCs was found to be intact even after exposure to PrGO. MSCs treated with PrGO showed exceptional cell viability even after 72h exposure, indicating that no cytotoxic effect was elicited by PrGO. More than 80% cell viability was evident from the results of MTT. The MTT results were in agreement with previous findings that graphene promoted differentiation and growth of MSCs (10). The analysis also depicted that the cells exposed to PrGO remained morphologically comparable to that of control cells. The morphological analysis results were in support with previous reports (11). Neutral red assays also showed similar results like MTT. Increase in PrGO concentration and exposure time showed an increase in lysosomal activity. An increase in ROS production with increasing concentration of PrGO was apparent from DCFH-DA assay. The ROS production by PrGO showed a time-dependent trend in DCFH-DA results. Increased ROS production leading to oxidative stress is commonly visible in nanoparticle toxicity (12). Enhanced ROS generation is a latent sign of PrGO to stimulate oxidative stress. But, favorably, no noticeable variation in cellular function or proliferation was evident in MSCs upon PrGO exposure. Henceforth, PrGO exposure and subsequent hike in ROS production do not lead to an alluring response. The lysosomal membrane integrity of PrGO treated MSCs was found to remain intact but a slight decrease in mitochondrial membrane potential was observed. No loss in the integrity of cytoskeleton of MSCs on PrGO exposure was detected. The absence of DNA fragmentation in DNA laddering assay depicts that PrGO does not induce any genotoxic effect and DNA integrity was sustained. No considerable increase in the activity of two major executors in apoptosis, caspase 3 and caspase7 was evident in PrGO treated MSCs. The results highlight that PrGO does not induce any substantial cell damage. The osteogenesis potential of PrGO was markedly noticeable from the increased ALP activity at 100μg/ml concentration of PrGO (Fig 3). Fig 3: Potential action of PrGO in the differentiation of MSCs for osteogenesis. Image courtesy Mohanan, P.V. In conclusion, the potential of PrGO in the differentiation of MSCs for osteogenesis makes them reliable candidates as tissue-engineering scaffolds. The results also envy the potential of PrGO as non-toxic delivery vectors of MSCs. From the results, it is anticipated that PrGO is a potential 2D material capable of making wonders in osteogenesis. These findings are described in the article entitled Nano-bio compatibility of PEGylated reduced graphene oxide on mesenchymal stem cells, recently published in the journal 2D Materials. This work was conducted by Syama, S. and Mohanan, P.V. from the Sree Chitra Tirunal Institute for Medical Sciences and Technology, and Aby, C.P., Maekawa, T., and Sakthikumar, D. from Toyo University. Chung C., Kim Y.K., Shin D., Ryoo S.R., Hong B.H. , Min D.H., 2013. Biomedical applications of graphene and graphene oxide. Accounts of chemical research, 46(10), 2211-2224. Lee W.C., Lim C.H.Y., Shi H., Tang L.A., Wang Y., Lim C.T., Loh K.P., 2011. Origin of enhanced stem cell growth and differentiation on graphene and graphene oxide. ACS nano, 5(9), 7334-7341. Bressan E., Ferroni L., Gardin C., Sbricoli L., Gobbato L., Ludovichetti F., Tocco I., Carraro A., Piattelli A., Zavan B ,. 2014. Graphene based scaffolds effects on stem cells commitment. J. Transl. Med. 12 296−310. Li Y., Liu Y., Fu Y., Wei T., Le Guyader L., Gao G., Liu R., Chang Y.,Chen C,. 2012. The triggering of apoptosis in macrophages by pristine graphene through the MAPK and TGF-beta signaling pathways. Biomaterials 33 402–11. Singh, S. K.; Singh, M. K.; Nayak, M. K.; Kumari, S.; Shrivastava, S.; Gracio, J. A.; Dash, D. Thrombus Inducing Property of Atomically Thin Graphene Oxide Sheets. ACS Nano 2011, 5, 4987–4996. Li B., Zhang X., Yang J., Zhang Y., Li W., Fan C., Huang Q., 2014. Influence of polyethylene glycol coating on biodistribution and toxicity of nanoscale graphene oxide in mice after intravenous injection. Int. J. Nanomed. 9 4697–707. Hummers W., Offeman R., 1958. Preparation of graphitic oxide J. Am. Chem. Soc. 80 1339. Syama S., Reshma S C., Aby C P., Toru M., Sakthikumar D., Mohanan P V., 2016. 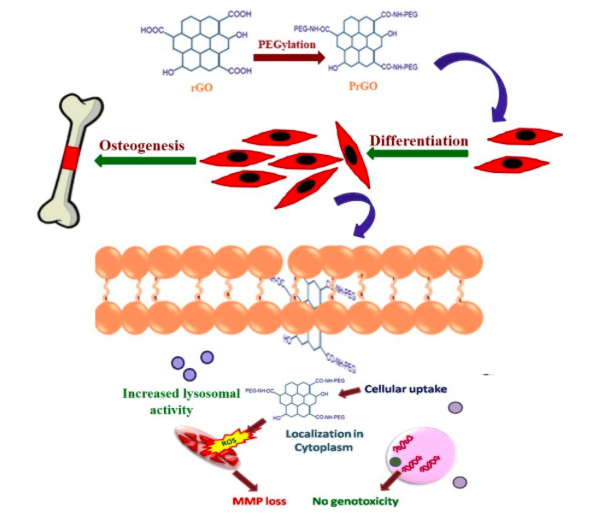 Synthesis and characterization of pegylated reduced graphene oxide: determination of toxicity using bone marrow mesenchymal stem cells JACSI 5 1–11. Ryu S., Kim B., 2013. Culture of neural cells and stem cells on graphene. Tissue Eng. Regen. Med. 10 39–46. Elkhenany, H., Amelse, L., Lafont, A., Bourdo, S., Caldwell, M., Neilsen, N., Dervishi, E., Derek, O., Biris, A.S., Anderson, D., Dhar, M., 2015. Graphene supports in vitro proliferation and osteogenic differentiation of goat adult mesenchymal stem cells: potential for bone tissue engineering. Journal of Applied Toxicology, 35(4), 367-374. Zhang, X., Hu, W., Li, J., Tao, L.,Wei, Y., 2012. A comparative study of cellular uptake and cytotoxicity of multi-walled carbon nanotubes, graphene oxide, and nanodiamond. Toxicology Research, 1(1), 62-68. S. Syama is a research scientist at the Sree Chitra Tirunal Institute for Medical Sciences and Technology.